Skipness is a small village on the eastern shore of the Kintyre peninsula, looking across the Kilbrannan Sound towards Arran. There are also magnificent views to Cowalside, Bute and the Ayrshire coast. It is a quiet haven, where the main activities are farming, forestry, tourism, fishing and conservation. The village has a shop/post office, a church and a small primary school. 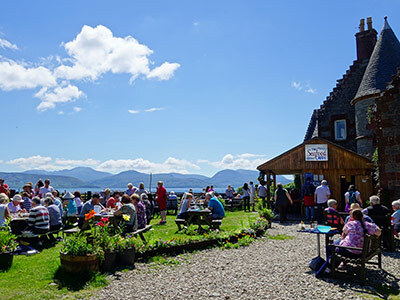 The Village Hall holds regular Ceilidhs and dances during the year for locals and holiday-makers alike. Skipness Point marks the beginning of Loch Fyne and evidence can still be seen of the moorings where ships of long ago were once fastened. The very word Skipness, which in the ancient Nordic tongue means “Point of the Ships”, conjures up pictures of the Vikings who dominated the Highlands and Islands for so long. 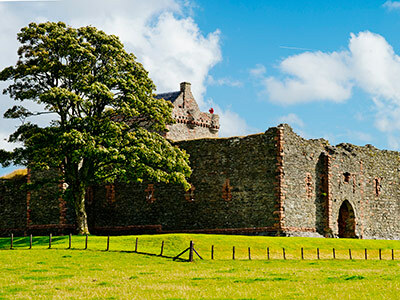 To secure the peace, the building of the first Skipness Castle began in the 13th century and the ruined walls and massive tower house still guard the shore. It ts one of the earliest standing castle buildings in Scotland. The ruins of the medieval Kilbrannan Chapel lie just a little further, towards The Point. 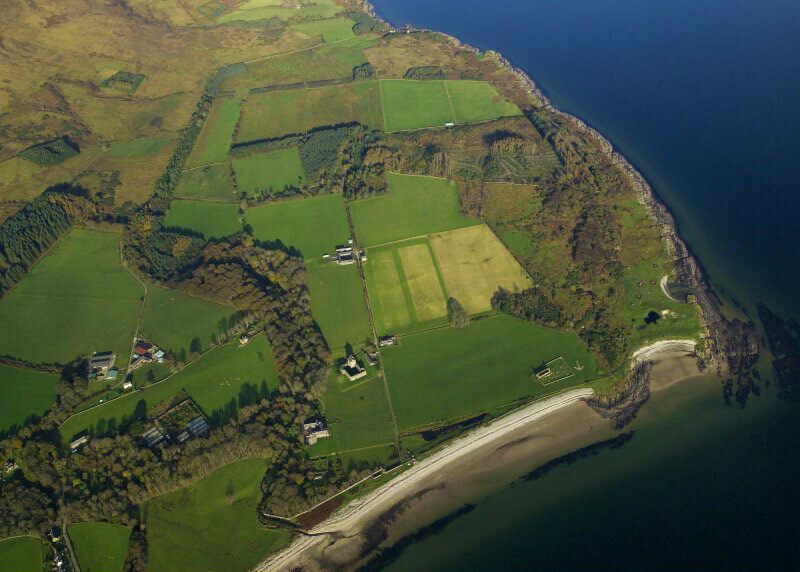 Skipness Estate has been in the ownership of the Oakes family since 1936. The farm has a beef herd of approximately 60 Simmental-cross cows calving during the summer. There are also 500 breeding sheep made up of Scottish Blackface, Cheviot and Texel crosses. The farm has 500 hectares of land which is a mix of hill, rough grazing and permanent pasture. There is also approximately 50 Ha of mixed woodland. Skipness’ woodlands are being managed within the family, producing sustainable local firewood, and also timber by way of a recently acquired mobile sawmill. The Estate has had self-catering holiday cottages since the 1950’s, all are traditional estate houses or conversions of. In 1990 The Seafood Cabin was established in the grounds of Skipness House and still flourishes there today. 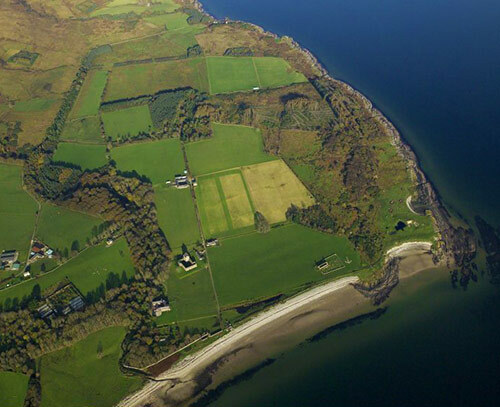 View Skipness yourself with this interactive 360° panorama. Click or swipe the image below to pan and zoom. A seasonal family-run venue that prepares and sells locally sourced, fresh seafood dishes. It also provides a variety of homemade cakes & scones with a choice of beverages. 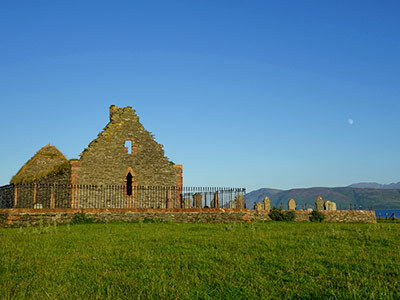 Set next to Skipness House, the Castle is a short walk away and stunning views of Arran and the Kilbrannan Chapel are on offer. The licensed restaurant aims to provide an easy going, relaxed atmosphere where everyone feels comfortable and leaves satisfied! Open 11am – 7pm, 29th May – 2nd Oct. Go to Seafood Cabin page. The ruins of this 13th Century castle, dominate the surrounding landscape. The courtyard is open to the public all year round, and the tower house is open every day from the 1st April to 30th September, 9:30am – 6:30pm. The views from the tower are spectacular. Entry is free. Go to Skipness Castle page. The Village shop sits in the centre of the village selling everyday essentials and proudly showcasing local crafts. Home made greetings cards and hand knitted baby clothes made by local residents are for sale, along with the owner’s delicious home-made jams. The shop doubles as a tea room serving a hot cuppa and freshly made sandwiches, which can be eaten on the picnic benches on the beach opposite. 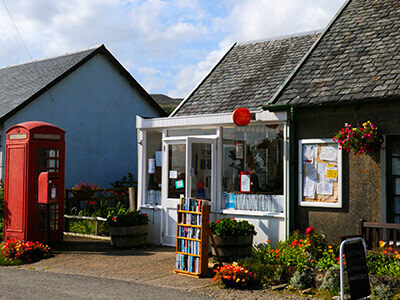 The Post Office is in the village shop and open from 9am – 1pm, Monday to Friday. Skipness Estate’s latest development is a new smokehouse, built for Creelers (of Arran and Edinburgh fame), on the site of the old estate workshop. Creelers is also run by the family and the new smokehouse will become the home for all their smoked products when they move production here in 2016. They plan to provide tours of the smokehouse and you will be able to buy smoked goods from their shop. For more information, and to order delicious smoked fish right now, visit the Creelers website. 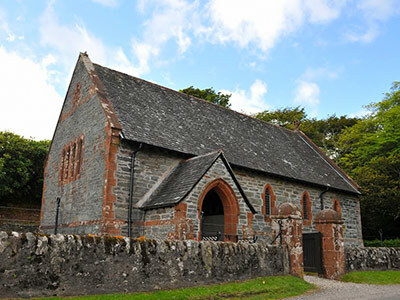 Kilbrannan Chapel lies closer to Skipness Point than the Castle and close to the shore. The MacDonalds built Kilbrannan Chapel around 1300 when they converted the original MacSween castle and chapel into one larger, more impressive residence. In the surrounding graveyard are some excellent examples of elaborately carved gravestones and a number of mediaeval burial slabs. The cemetery is still in use today and the grounds are looked after by the local council. St Brendan’s church lies at the far end of the village, just before the humpback bridge over Skipness River. The church was designed by Bertram Vaughan Johnson and built in 1896-7. 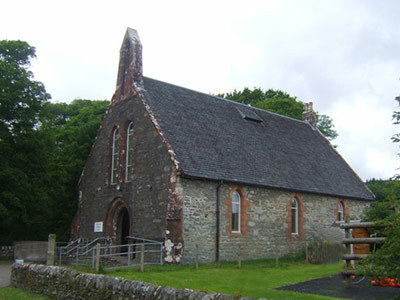 It is a small country church with walls of local grey stone with red sandstone margins. The east gable is ornamented with a small Celtic cross. The lancet windows have leaded lights. The interior is simple with a open timber roof. One of the stained glass windows features Celtic interlacing designed by R C Graham of Skipness and made by Powell & Co, 1897. There is a regular Sunday morning service. 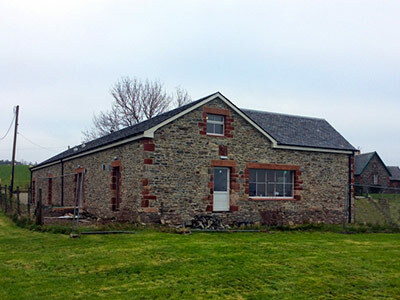 Skipness Village Hall is a community managed charity that hosts various events and can also be hired for private functions. It has a small kitchenette, disabled access and toilets. Scottish country dances and Cèilidhs with a live band are often held in the hall so check the noticeboard for upcoming events.